First up in our analysis of the "Little Neighborhoods" is Little Korea. Little Korea is generally considered to be the stretch of restaurants, hotels, and other business that cater to the Korean community on 32nd street between 5th avenue and 6th avenue. Almost all the restaurants are open 24-7 (if you're a businessman who just flew in from Korea, lunchtime is 3:00 AM here), the Karaoke is always a blast, and there's a decent rooftop bar above the La Quinta Inn with a nice view of the Empire State. Now, I can tell you with absolute certainty that the absolute largest number of Koreans that live on 32nd street between 5th and 6th is 21. 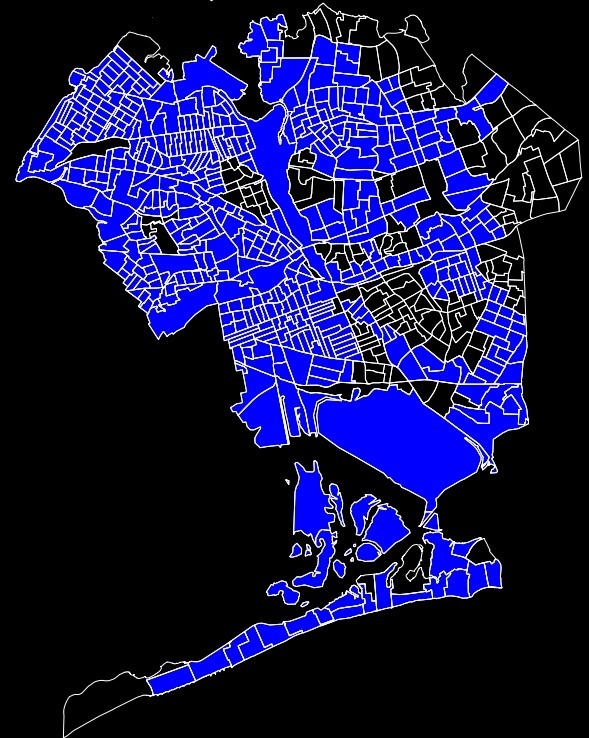 Most data is only available at the Census Tracts level, which in Manhattan is generally an area of something like five North-South Blocks by two East-West blocks. However, questions asked of everyone on the short form - 100% data - go as far down as the individual block. 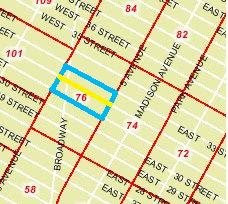 This isn't a great geographic division - a "block" is one square block, not one street. 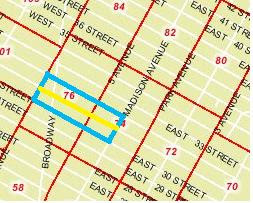 For example, "Block 1005 of Census tract 76" is the south side of 32nd street, the west side of 5th Avenue, the north side of 31st street, and the East Side of Broadway, not 32nd street between 5th and 6th. Still, we can amalgamate blocks 1003, 1004, 1005, and 1006 of Census Tract 76 to encompass the Little Korea strip, plus the north side of 31st, the south side of 33rd, the west side of 5th Avenue, all of Broadway, and and the east side of 6th Avenue between 31st and 33rd streets (outlined below - the Little Korea commercial strip is in Yellow). What we find is that there are exactly 21 people who describe their race as "Asian," either alone or in conjunction with one or more other races. Now, even if all of these Asians were Korean, and all of them lived on 32nd street, that's still 6 less than the number of restaurants I counted. So I'm calling it now for "restaurants" in Little Korea. To be fair, however, only 70 people total live in this area. So let's take a little bit broader look at the neighborhood. Even if you just stretch "Little Korea" across 5th Avenue to encompass 32nd street between Madison and 5th as well, adding another two blocks, it makes a difference. Now the total population of Asians rises to 65 - more than the number of restaurants on the same stretch. Still, that's out of 296 people, for a grand total of a maximum 22% Korean. And that's assuming all Asians on 32nd street are Korean. While we don't have an exact count of Koreans until the census tract level, we can do some extrapolating. In Census Tracts 74 (which encompasses 32nd street between Madison and 5th) and 76 (which encompasses 32nd street between 5th and 6th) 23.7% of people who checked "Asian" also checked "Korean." 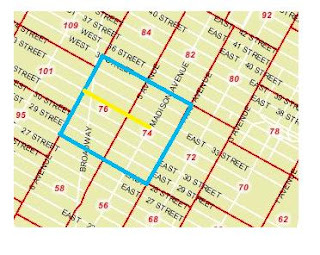 Extrapolated down to the block level, it would mean only 15 Koreans on the stretch of 32nd street between Madison and 6th - way less than the number of restaurants. However, what if we count the surrounding area as "Little Korea" as well? After all, 32nd street is a commercial street without a lot of residents in general. Since we have to go up to the Census Tract level to get data specifically for "Koreans," we can use Census tracts 74 and 76. That encompasses the area from 28th street to 35th street, between Madison and 6th, as you can see in the map below. This is a very, very generous definition of Little Korea. Using this definition we get 365 Koreans out of 6205 people - or about 6%. That's higher than the percentage of Koreans in New York City as a whole, but much less than other tracts, such as Queens Tract 1161 in Flushing, which is almost 1/3 Korean. A still generous, but slightly more realistic definition would be Block Groups 1 of Tracts 74 and 76, which is 31st through 35th between Madison and 6th. Here we have to do some extrapolating. There are 503 Asians in these block groups. Using the information we gathered before - that in these two Census Tracts 23.7% of Asians are Korean - we're left with 120 Koreans in this area. You could up that number somewhat based on the idea that the Korean community in these Census Tracts might be somewhat concentrated closer to 32nd street. So what do we have? At most, a few hundred Koreans in the general vicinity of what is called "Little Korea," representing less than 10% of the population. Not completely insignificant, but certainly not anything to portray as a Korean Neighborhood, per se. It's even less than the 515 Korean residents that the tiny Little Korea in the Bronx had in 2000. As you can see, doing this kind of micro-demographic analysis is an imperfect science for a lot of reasons. And we're not even getting into what kind of Koreans live in Little Korea - old or young, recent arrivals or third-generation citizens, rich or poor. Still, in a city that's as concentrated and changes from block to block as much as New York, it's an analysis you have to be able to do. How else are you going to support claims like "there's more Korean restaurants than Koreans in Little Korea?" Next up - Little Brazil. No, not the small neighborhoods - the ones that start with the word "Little." Over on my other blog I make the claim that "there are no Koreans in Little Korea, there are no Brazilians in Little Brazil, and there are definitely no Italians in Little Italy." I decided I should crunch the numbers for a claim like that, so we're going to check it out. Nate Silver would be proud. 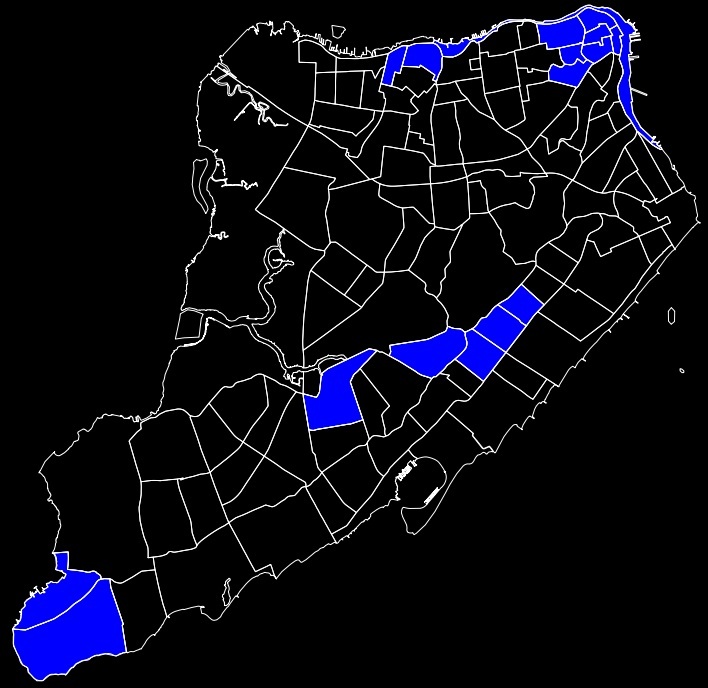 I'm also adding in Little Italy in the Bronx, Little India in the East Village, and a couple others that NYC & Co (the city's marketing arm) has invented for it's 9 in 09 campaign - Little Sri Lanka in Staten Island, and Woodlawn in the Bronx, which NYC & Co. insist is "Little Ireland." Little Brazil: this is a tough one. More people. Both in single digits though. Little Italy in the Bronx: more people. Little Sri Lanka: more people. Woodlawn (Little Ireland): more people. Now, the numbers will not be that accurate. These are all micro neighborhoods, meaning the largest (Woodlawn) is only 4 census tracts. We have to go all the way back to the 2000 census to get tract-level data, and we all know the city has changed a great deal since then. There are ways you can developed trending numbers based on the American Community Survey from 2007 and other sources, but not for such detailed data and small geographies. So keep in mind the question is not going to be "how many Italians are in Little Italy?" it's is going to be "how many Italians were in Little Italy in 2000?" And I'm going to be comparing this against the restaurants I count there in 2009, so the "more people or more restaurants" question won't be an entirely accurate comparison. Second, there's the question of what constitutes someone who is "Korean" or "Italian" or "Brazilian." Is it someone who was born in the respective country? Someone who speaks the language? Someone who self-identifies as being of that particular ancestry? These are all questions asked on the census, and all questions that can be used to determine someone's ethnicity. Does a kid from Jersey whose great-grandparents were from Italy count as "Italian" if he's currently living in a Mulberry Street tenement with two of his NYU roommates? For purposes of this exercise, I'm going to be as liberal as possible in determining who is "Korean" or "Italian" or "Brazilian." Third, we will have better data for some neighborhoods than others. This is because the Census gathers racial and certain ethnicity information on their short form that everyone gets, but gathers place-of-birth, language, and ancestry information from only the 1 in 6 households who get the longer form. The census bureau specifically counts "Korean" and "Asian Indian" as "races," but Italian, Irish, and Brazilian as ethnicities, so as a result we have 100% data for Koreans and Asian Indians, but only sample data for the others. Sri Lankan is interesting, because while the short form lists Korean, Japanese, Chinese, Asian Indian, Vietnamese, and Filipino as races under the "Asian and Pacific Islander" category, after that it goes to "Other Asian." So we have potential 100% data for Little Sri Lanka, but it has to be looked at pretty carefully. We'll start with the easiest one, Little Korea, next post. 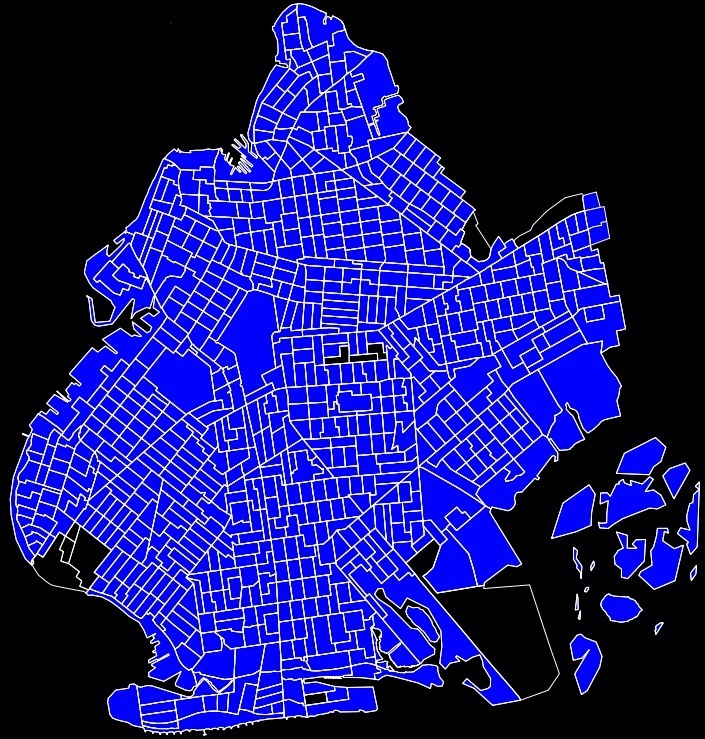 Queens, as you may have heard, is the most diverse county in the United States. And there's a lot of interesting and vibrant areas that are a result of this diversity - generally concentrated in the Northwestern part of the Borough. It's always fun to go visit Jackson Heights or Astoria or Elmhurst and see what kind of stuff you run into. This vibrancy and energy is a far cry from 20 or 30 years ago, when the neighborhoods were much more monolithic. There are, however, some other neighborhoods that are just as ethnically diverse but are far more boring. Just because people now hail from all over the globe doesn't mean the nondescript sidewalks and houses of Woodhaven and Ozone Park are that different from a generation ago. The faces are different, the neighborhood remains the same. Boring doesn't mean bad - the area's certainly pleasant, just not really the type of place to go looking for anything of note. But I haven't walked the whole area - maybe I'm missing something right around the corner. Between the J-train and Forest park there's a lovely area of Victorians that remind me of similar areas in Flatbush. It's fairly high on my list of areas I'd like to live in if I ever decide the quasi-suburban life is for me.